In April last year, we went on a trip to France with our school and had to go to JFK airport. Amanda was just waiting in security and who was next to her?! MAROON FIVE!!! Amanda and our friend were able to talk to Adam Levine (the main singer) for awhile while they waited to go through security. Once Amanda and the band came through, we (Rachel and Amanda) asked Adam for a picture. He was really nice and took a few pictures with us because the person taking the picture's hand was shaking so much that the first few came out blurry. 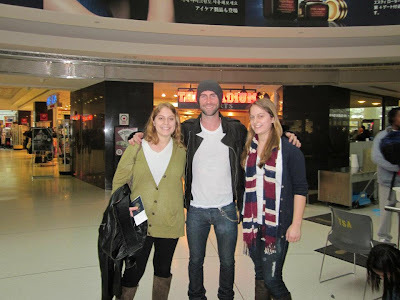 After getting a good pic, Adam suggested he take a picture with everyone in the exchange! He was so sweet and it was the perfect celeb run in."